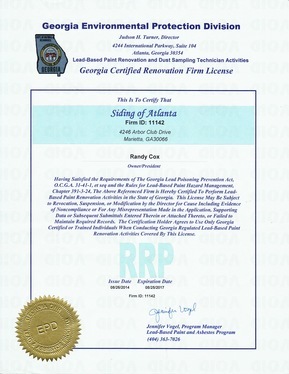 At Painting of Atlanta, we pride ourselves on giving our customers quality materials and exceptional service. 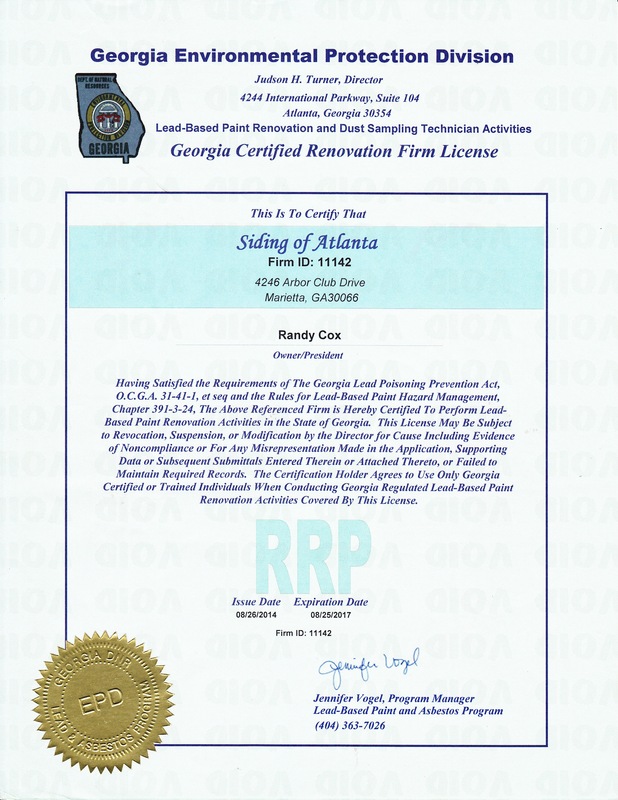 Painting of Atlanta uses only high quality Sherwin-Williams Exterior Acrylic Latex Paint and SherMax Caulk. Our bid price always includes painting your entire house, not just painting the replacement siding and trim. Our suggestion would be to drive through neighborhoods and find colors that you like. Once you have the color or colors you like, Painting of Atlanta will apply some sample paint on your home to allow you to see how your color selections looks and help you make the best color decision for your home. Count on SuperPaint Exterior Acrylic Latex to protect against the elements. Cold and frosty or hot and humid, this exterior acrylic latex paint goes on fast and provides excellent protection against mildew, fading and peeling. And thanks to its advanced acrylic resin formula, you'll enjoy superior adhesion and color retention that lasts and lasts. Flat - This non-shiny finish is great for hiding surface imperfections because it deflects the light. Satin - With its slight gloss, this finish offers the benefits of a richer look. Gloss - This lustrous, durable finish is great for windows, doors and trim or any area that you would like to highlight. High Gloss - This finish offers a higher shine compared to its gloss counter part and is great for trim or other accent areas. Colors - With over 1,500 colors to choose from, mix and match colors within a palette to bring your color ideas to life. Not all colors are available in all product lines. See store for details. Duration® Exterior Acrylic Latex Duration Exterior Acrylic Latex Coating saves you time and money without sacrificing performance. Because of its revolutionary PermaLast® technology, this coating goes on 70% thicker than ordinary exterior house paint with just one coat, you save the expense of a two-coat job and cut your work time in half. Plus, it’s 50% more durable than other premium exterior paint and is guaranteed against peeling and blistering for as long as you own your home. Resilience™ Exterior Acrylic Latex - Don’t let weather worries ruin your painting schedule. Resilience Exterior Acrylic Latex paint gives newly painted exteriors moisture resistance in half the time as conventional paints. So you don’t have to postpone painting when the forecast calls for rain, or quit working early in the day because you’re concerned about dew. And if you don’t get around to painting the house until later in the season, don’t worry. You can apply Resilience coatings in temperatures as low as 35°F. Backed by a life Finishes Flat This non-shiny finish is great for hiding surface imperfections because it deflects the light. Colors With over 1,500 colors to choose from, mix and match colors within a palette to bring your color ideas to life. 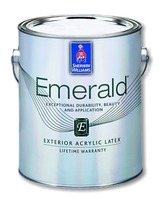 Emerald Exterior Acrylic Latex Paint - Revolutionary technology with best-in-class overall performance. Our finest exterior paint, Emerald Exterior Acrylic Latex Paint is self priming with a smooth beautiful finish and provides exceptional hide. Backed by a lifetime limited warranty, Emerald offers exceptional durability, a mildew-resistant coating and delivers extreme resistance to blistering, peeling and color fade. Our finest paint with best-in-class overall performance. Features an exclusive cross-linking 100% acrylic technology for exceptional durability and hide. Extreme resistance to blistering, peeling, fading and dirt pickup. Self-priming with a smooth, uniform appearance. Meets the most stringent VOC regulations. Low temperature application down to 35°F. Sherwin-Williams VinylSafe® paint colors allow you the freedom to choose from 100 color options, including a limited selection of darker colors formulated to resist warping or buckling when applied to sound, stable vinyl siding. Available in all Sherwin-Williams colors and custom tints in flat, satin and gloss. Flat - A non-reflective appearance that helps hide surface imperfections. Copyright © 2016 Windows of Atlanta. All rights reserved.